This afternoon I started laying things out. The tool cabinet poster went up on the wall where the real cabinet will ultimately reside. 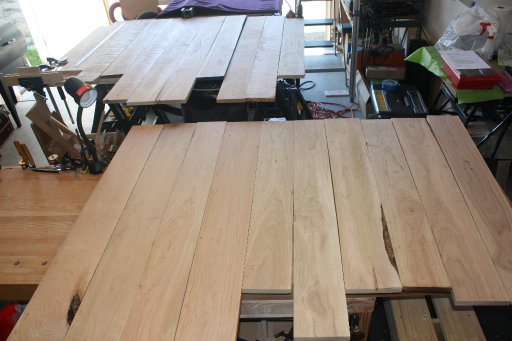 I started laying out all the cherry and trying to match up pieces for gluing. 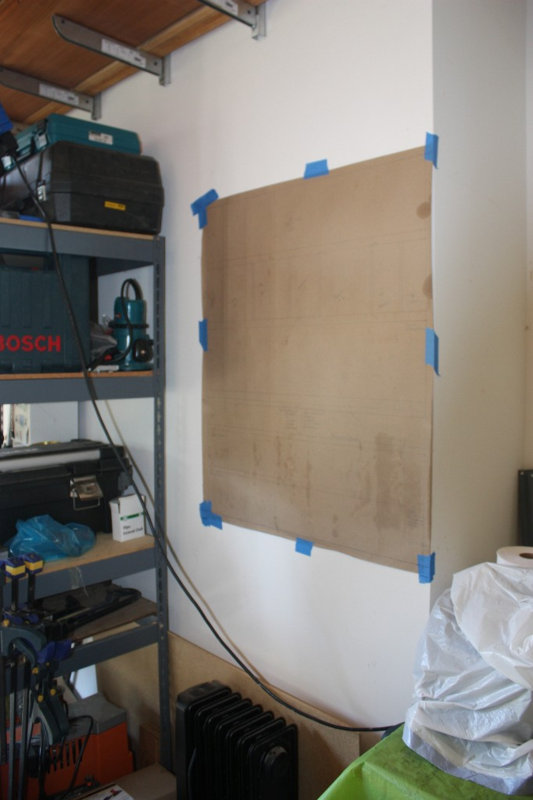 Most sides of the cabinet will require gluing 3 boards together and the shelves 2 boards. Four sides and FIVE shelves. Then there’s the back which will use up the remaining tongue and groove fir I have left. And then there’s five drawers to be made. And finally I got out the panels for the door fronts. 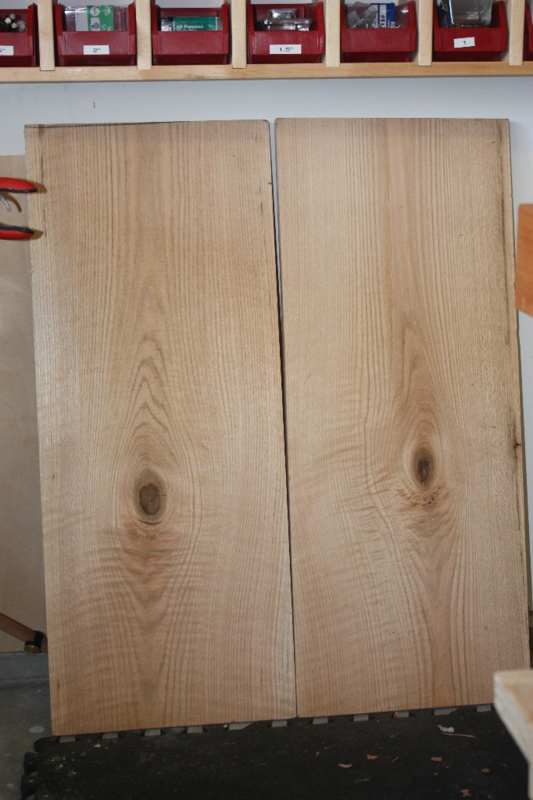 These are book matched oak and 3/4′ thick that I’ll need to take an 1/8 to 1/4″ off of so they’ll be proper door panels. By the time it was all over, I was starting to feel a bit overwhelmed. So I ran upstairs to look at the newly completed bathroom wall cabinet .. I think I can, I think I can …. This is the final design. 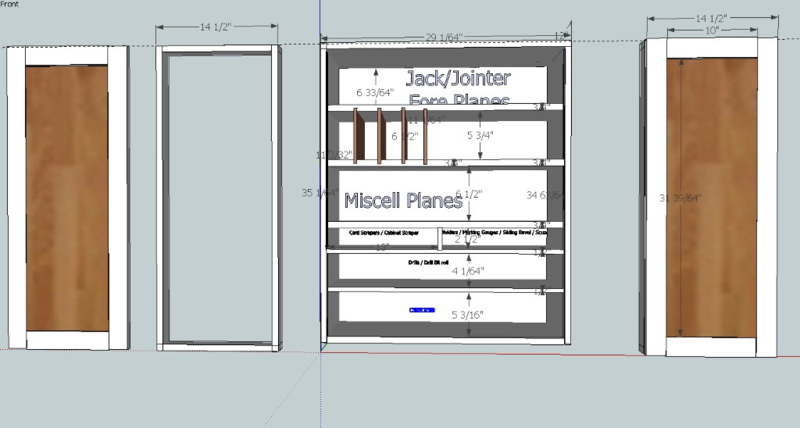 The bottom 3 slots will have drawers in them (not drawn). Cubbies on the second and third shelf will go all the way across the cabinet (not drawn out) and are spaced for individual planes. 7 Responses to I can do this right??? Do you have a design that your going after? I'm curious as I'm building a saw till now but after it will be a new tool cabinet. After looking through your projects photo album, yes, you can! High five for another Seattle woodworker (and blogger). Good luck on your project, you can do it! Hey Badger, sneaked a peek at your blog. VERY cool! Yeah for Seattle and a fun blog to keep tabs on!